IBM Tivoli OMEGAMON XE for Messaging Version 6.0 is a follow-on product to IBM Tivoli for OMEGAMON XE for WebSphere Business Integration. It provides the capability to manage IBM WebSphere MQ, WebSphere Message Broker, and WebSphere InterChange Server environments from a single console. It supports distributed and mainframe systems and provides an end-to-end view across all systems. It analyzes application performance and identifies slowdowns and monitors message rates, brokers, message flows, and subflows. This IBM Redbooks publication describes the installation, configuration, and troubleshooting of IBM Tivoli OMEGAMON XE for Messaging on Microsoft Windows, IBM AIX 5L, Linux, and IBM z/OS platforms. We also describe the OMEGAMON framework architecture with typical deployment scenarios, best practices, and scalability considerations. This book is an update to Implementing "IBM Tivoli OMEGAMON XE for WebSphere Business Integration V1.1," SG24-6768. 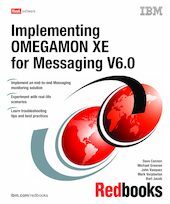 This book is essential reading for IT specialists who will implement IBM Tivoli OMEGAMON XE for Messaging.